A family of JACKSONs lived and farmed at Culloge and Monadarragh both in the Parish of Mostrim, in the Barony of Ardagh from the early 1700s until well into the 1900s. Where the original Richard JACKSON came from is still a mystery. SEE: Family tree of JACKSONs of Co. Longford as well as my Blog post. NOTE: In Griffiths Maps, there are indications of a couple of Forts in Culloge as well as a couple more forts in Monadarragh. There is also a record of the Old Corn Mill, mentioned as early as 1722, in the townland of Monadarragh. County Westmeath is on the south-western border of Monadarragh. SEE ALSO: Deeds mentioning JACKSONs & POOLEs. NOTE: Some deeds are also included that relate to John and William JACKSONs of Paradise Road City of Dublin. They also held leases in Co. Longford. 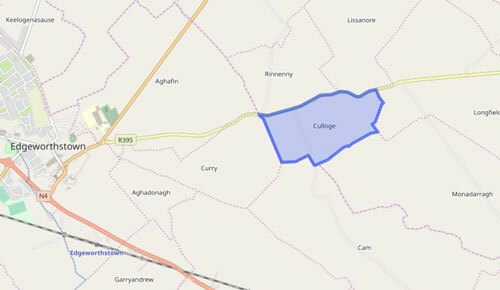 These maps of Culloge and Monadarragh can be found at Irish Townlands. NOTE: In 1641 Cam was held by John NUGENT and then in 1670 it was held by Edward NUGENT. Both NUGENTs were Catholic. Hugh FARRELL and John NUGENT also owned Cowloge aka Gneeve aka Cullivre (not to be confused as Culloge). In 1748, there was a lease btw Dr. John FARRELL of City of Dublin and Philip JACKSON of Culloge. It seems that the descendants of the pre-Cromwellian owners still retained some connection to the land. Bentham's abstracts describe the first Richard Jackson in this region as being of Tinenane aka Tenenare aka Tinenare etc ... (see entry for 1767). For one of the clues that Teninare was in the townland now called Ballindagny and Cullyvore, see the deed beneath #47609 dated Feb 11, 1730. Sir Chamberlain WALKER of City of Dublin set to Richard JACKSON of Tenere Co. Longford Farmer lands of Clontumper containing and lands of Cullysoredon[?] 2 a and 120a formerly held by Gary MOORE and Teverin situate in Barony Longford Co. Longford with appurtenances for 21 years for rent of £20. WITNESS: Thomas ANDREWS & William DRURY Clerks to Mr. William SUMNER Notary in Dublin. NOTE: The deed 49456 on the same page was WALKER-CONNOLLAN. Btw Richard POOLE of City of Dublin Joyner one of the sons of Richard POOLE late of Earl St in the Liberty of Thomas Court & Donore and Co Dublin Gent & Philip JACKSON of Ballinrahn [Ballinrahin, Parish of Clonsast, in the Barony of Coolestown,] Kings Co farmer and intermarried with Jane POOLE one of the daughters of the said Richard POOLE the elder, and who is also the executor of the last will of George JACKSON deceased who intermarried with Mary POOLE one of the daughters of said Richard POOLE, and Susannah GEORGE als POOLE of the said city widow, also one of the daughters of the said Richard the elder & Robert POOLE of Dublin Tinplate worker & son of Richard POOLE elder.. sold lands of Coshina [Cushina Parish of Clonsast, in the Barony of Coolestown,] and Monavaine, Barony of Coolistowne, Kings Co… and lands on Earls St in Liberty of Thomas Court & lands of Ballynowland, barony of Coolistown [Coolestown] Kings Co…NOTE: George JACKSON, husband of Mary POOLE of Moneydonagh died before 1732. NOTE: See also: JACKSON-GILL Book Index 1708-1729 Joseph JACKSON, Cork Street, Liberty of Donore, Dubin, weaver 1722 Jan 11 NAMES: Joseph JACKSON; Joseph GILL; Mr. POWER; Thomas WESTON; Jacob POOLE; George CULLIN; Rebecca SMITH; Michael SMITH; Michael SMITH jr.; Hannah SMITH; Joseph ROSE; William BARRY; Bruen WORTHINGTON. PLACES: Cork St, & Earl St. both in the Liberty of Donore, Co. Dublin. with reference made to (b) 2 Aug 1703 & (c) 20 Apr 1723  leases thereof) Isabella GORE daughter of Hon. Brigadier Francis GORE of Clonroad Co. Clare and wife of William CAUSABON of Carrig Cork NOTE: Part of transcription thanks to Dawn LOWE..
Btw Richard JACKSON, City of Dublin, Esq & Grand-nephew & heir at law of John EYRE late of Eyre Court., Co. Galway Esq. Deceased… townland of Annaccalla, Barony Longford, Co. Galway. Also a dwelling house on west side of Dawson Street, City of Dublin wherin Matthew FORD lately dwelt. Built by William WILD containing 19’ in breadth, on Dawson St, , 25’, in depth from front to rere 220’adjoining on east to Dawson Street, on west to lane and waste land belonging to WILD and to the north to a house owned by John DAWSON Esq. & on south to another house owned by William WILD together with the Coach House and Stable behind the said dwelling house NOTE: Francis EYRE (1708-?) of Eyre Court was wife of William JACKSON (1695-1744) John EYRE, uncle of Francis EYRE, died 1745, therefore this Richard JACKSON is likely Sir Richard JACKSON (aft 1729-1789) SEE: Jacksons of Coleraine. NOTE: Not in Co. Longford. Btw William JACKSON of Edgeworthstown , Co Longford, Gent & Thomas LITTLE of same Gauger whereby William JACKSON demised to Thomas LITTLE part of lands of Calogue Co. Longford in possession of William WHITLOW Gent together with part of lands of Calogue known by the name of Windmill Hill in possession of Patrick MAGRATH and partners and Christopher NUGENT with that part of the Bog of Cam now in their possession for lives of said Thomas LITTLE Jane LITTLE otherwise JACKSON his wife and William JACKSON the said William JACKSON’s eldest son. for lives … rent of £1.5.6 annually WITNESS: Laurence CONNELL and William FORSTER. NOTE: I suspect that Jane LITTLE was a daughter of Philip JACKSON and Jane POOLE, hence a sister to William JACKSON. In view of pending marriage both parties [Thomas NORRIS, tanner of Dublin City and Anne JACKSON, widow of Dublin City] covenant that on their own death, their property to the other. WITNESSES: Elizabeth BROWNE, spinster of Paradise Rd., Dublin & William O’BRIEN, gent of Dublin City. BTW George CRUICKSHANK of City of Dublin Attorney at Law of 1st pt & Alexander CROOKSHANK Esq. & George SALE Merchant both of City of Dublin of 2nd pt & Abigail SALL aka SALE of City of Dublin spinster of 3rd pt. Reciting that William CLARKE by indenture 1718 Nov 15 demised to William NICHOLS piece of ground on south side of Pill Lane containing front to rere 57’ including the wall to the lane bounded on the east to other ground owned by said William CLARKE on the South & West to ground set by said William CLARKE to Mrs. .. granted to said William SALE Robert Ballentine …. And that the same having become vested in William SALE late of City of Dublin Gent deceased 10 Jan 1774 for lives of [Royalty] and Thomas JOHNSTON and Thomas TAYLOR and also reciting that Henry PERRY Esq. by indenture 4 July 1722 demised to John HARVEY tenement on North side of Dolphins Barn containing in breadth in the front 48’ in depth front to rere 63’ bounded on East by Mr. John FALKNERs holding, on the West by John BROWNEs holding on the North to the City Water Course commonly called the Pipe Water & on the South to Dolphins Barn aforesaid … also reciting that Jacob POOLE by indenture 14 Feb 1722 demised to William BOTTOM all the 6 small houses with their backsides situate on the south side of Dolphins Barn bounded on the North to the Kings pavement on east and south to Mr. BOARDMANs holding and on the west to Mr. POPKINs holding for lives of Emerson PERCY Hester POOLE & Elizabeth POOLE … and George CROOKSHANK was seized of lands of Cranleaghbegg otherwise Cranlabogg 140a Co. Longford. NOTE: Abigail SALE married George CRUICKSHANK firstly, and then married Henry JACKSON of Grange Cottage, Birr, Kings Co. SEE: JACKSONs of Kings Co. - Seirkeiran. Btw Wm JACKSON of Cologue, Co Longford Gent & Richard JACKSON eldest son of 1 pt & George BOND of Lisnonah Co Longford. John JACKSON and William JACKSON both of Moneydarragh, Co Longford Gents of 1 pt & Robert MOORE and Lewis MOORE both of Upper Moneydarragh Co. Longford farmers and William WAIRE of City of Dublin farmer of other pt. 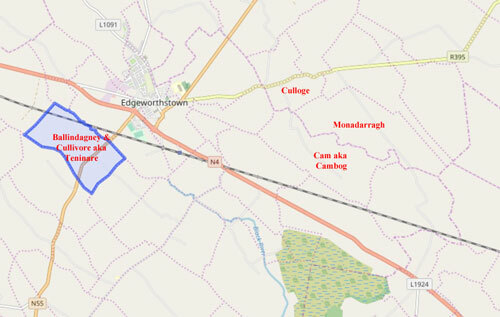 demised part of lands of Moneydarragh, Parish of Edgeworthstown, Barony of Ardagh, Co Longford then in possession of Robert & Lewis MOORE containing 56a and yearly rent of £48 for 99 years. WITNESS: Richard JACKSON Gent & James SMYTH Attorney & Michael MOORE of Moneydarragh Yeoman. NOTE: The relationships are not stated here. Father & son? Brothers? Other? BTW Henry GORE of Tenelist, Co. Longford of 1 pt & [Treke LENOW? LENNON?] of Liscomuck Co. Longford Esq of the other pt. Reciting that Henry GORE demised lands of Liscormick & part of Laggan late in possession of Sandys LENNON cont. 99a 1r in Co. Longford for lives of [Ficke?] LENON, Sarah LENON otherwise [ED]GERS his wife & Thomas LENNON of Mullinmeckan Co. Westmeath Gent ..
Btw Samuel JACKSON & Richard JACKSON both of Callouge, Co Longford Gent of 1 pt & William BOND of Edgeworth, Co Longford…. 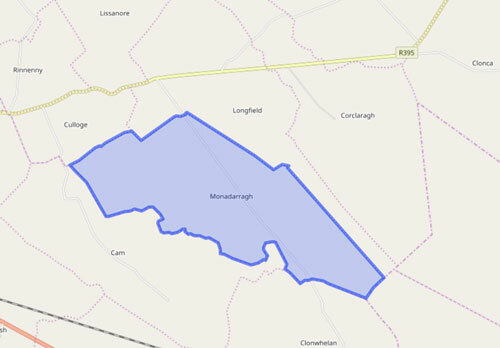 Lands of Moneydarragh, Co Longford as formerly possessed by Richard JACKSON the uncle of said Samuel and Richard JACKSON Samuel JACKSON of Callouge, Co. Longford and Richard JACKSON Gent of Callouge, Co. Longford of 1st part. William BOND Esq. Of Edgewoth, Co. Longford And Richard JACKSON, uncle of aforementioned Samuel & Richard JACKSON. Registrar, John MOORE. Witnesses William ASLOP & James GAINNON [or GAMNON?]. Agreement that Samuel & Richard JACKSON of 1st part for consids should and would with all speed sell & convey unto William BOND the lands of Monydarragh, co Longford with bog and appur's, as formerly possessed by Richard JACKSON sr. NOTE: The Uncle Richard JACKSON died bet May 1767 and Feb 1768. Elizabeth FERRALL & Catherine FERRALL, spinsters and daughters of John FERRALL, Doctor of Physic, deceased of Dublin of the 1st part William JACKSON, Gent of Callage, Co. Longford & Richard & Samuel JACKSON, sons of William JACKSON of 2nd part. William BOND Esq. Of Edgeworth of 3rd part. Richard MONAGHAN. John MOORE, Registrar. Witnesses: William ASLOP, Gent of Dublin City & James Wensley LITTLE, Gent, of Dublin City. Moneyduragh ows Moneydurgh ows Monedurgh [123a arable + pasture] then in possession of Samuel JACKSON, with boggs & appur's as well as pt part of lands of Callaughe ow Calloge called Stevakstown [42a areable pasture] now in possession of Samuel JACKSON by virtue of lease for one life or 31 years from Richard JACKSON+ Bog, in Longford Co, released by FARRELLs & JACKSONs unto William BOND part of lands of Callaughe ow Calloge called Tonanovery ows Tonanovera [27 acres] in Longford Co, then in possession of William & Richard JACKSON and undertenants of Richard MONAGHAN, + Bog, in Longford Co, released by FERRALLs & JACKSONs unto William BOND. Btw William JACKSON and Richard JACKSON both of Callouge, Co. Longford of 1 pt & William BOND of Edgeworthtown Longford Esq of the other. Reciting that William JACKSON and Richard JACKSON were possessed in fee farm of the Demesne lands of Callouge and Windmill Hill which is a subdivision of said lands of Callogue together with the bog and appurtenances in Co. Longford under a fee farm grant made by Robert MONTGOMERY and David FAIRFIELD to Richard and Philip JACKSON both deceased and also of the lands of Moneydarragh dated 23 Jul 1715 …. Vested in William and Richard JACKSON and William BOND had concluded an agreement with the said William & Richard JACKSONs … £600 paid to William and Richard JACKSON for… 78a exclusive of said bog Grant made… Philip JACKSON deceased… lands of Callough… WITNESSES Hugh KELLY and Samuel JACKSON. NOTE: There are a slew of names – including MADDON – maybe worth transcribing in full. Btw Richard JACKSON of Callogue Co. Longford Gent of 1 pt & Edward JACKSON of Callogue farmer… set to Edward JACKSON lands of Collogue..5a 3r…Parish Mostrim, Barony Ardagh in his possession. Bounded on the North by Great road leading from Edgeworthstown to Granard on the East and south Richard GAINERs Land in Low Hill and on the West said Richard JACKSONs other part of lands of Collogue for term of 999 years with said Richard JACKSONs Bog in Monneydarragh yielding and paying to Richard JACKSON rent… signed Edward JACKSON & Richard JACKSON WITNESS: George ALLEN & John [?CLEVERS] NOTE: aka Culloge, Parish Mostrim, Barony Ardagh NOTE: I do not yet know who Edward JACKSON was. BTW William JACKSON of Paradise Row of City of Dublin, Gent of 1st pt; reciting transfer to John JACKSON house messuage & tenement on south side of Paradise Row [dimensions] in Lordship [of St. Mary’s Abbey, City of Dublin together with all articles of furniture to John JACKSON for lives [of Royal family members] WITNESS: Francis HIGGINS of Francis Lane, City of Dublin Grocer & Thomas BARRY of Golden Lane servant to Francis HIGGINS. Indentured deed of Assignment btw William JACKSON & John JACKSON both of City of Dublin Gent of 1st pt & John PEMBERTON of said City builder of the other part. Re property on west side of Paradise Row [description of boundaries & neighbours]. BTW Right Hon Warner William Lord Baron ROSSMAN of the 1 pt. & Francis JACKSON of Temple Bar City of Dublin Hat Manufacturer of the other pt…. Francis JACKSON agreed to purchase at price of £14,000 the lands of Longford otherwise Great Longford otherwise big Longford and Killauilly otherwise Killiwilly [aka Killavilla, Parish Roscrea] in Barony Ballybritt, Kings Co. ‘’’ Owen EVANS … William P. VAUGHAN of Golden Grove, Kings Co. … NOTE: He was Francis JACKSON (1776-1847) husband of Anne J. HASLAM. SEE: JACKSONs of Ballyboy, Kings Co. aka Offaly NOTE: These are not lands in Co. Longford. Btw Richard JACKSON of Longhill, Co. Longford, Gent of 1 pt & Robert WIGGINS of Granard. Co. Longford of other pt. … said Sidney DUIGAN Executrix of John DUIGAN deceased at request of John JACKSON granted to Lowell EDGEWORTH …WITNESS: John COLE of City of Dublin Gent & Sidney PARKER. John JACKSON [SEAL] NOTE: Sidney PARKER was a widow – see beneath. Btw John JACKSON of Harolds Cross Co Dublin Esq. & Henry Montfort BOND of Newtown Bond in Co Longford Esq of other pt…. for considerations assigned to BOND in his actual possession by virtue of a lease for one year parts and portions lands known as Linen Boherboy Annaghbegg & Aughakeeran with the sub denominations in Barony Moydowan, Co Longford. John JACKSON of Rathmines Esq. Co Dublin. Many lands in Longford. WITNESS: Frederick JACKSON of Rathmines, Dublin, Gent. NOTE: For more detail of lands see: ROD: 1837-20-277 beneath. ROD: 53.501.36647 Thomas FLETCHER of Rathmore, Co. Kildare, farmer & Henry JACKSON of Osberttown, Co. Kildare in consid of 50 pounds pd by Peter BURCHEAL of Kilkeel, Co. Kildare land of 430 acres also 20 acres in possession of Garret POOLE… land in Rathmore. In a later deed, 64-213-43516 - June 2, 1730, there is mention of Henry JACKSON sr. & sons Henry & Anthony, also in connection with lands of Ofberstown [aka Osberstown or Osbertstown or Osberttown.